In the most unusual blue-purple-aqua colours. I rarely buy cut flowers for myself, I'm allergic to so many that having flowers inside means putting them out in the cold every night so that I can sleep and they just don't last long with that kind of treatment. But I'd never seen this colour before and since I had dark blue and aqua in my curtain fabric I thought they'd look good in my lounge room. I did something last weekend that I haven't done in years. No, really, it's been years! This is something that I used to do almost on a weekly basis. Since moving here though, it's mostly been dust and wipe off spills. Well, last Friday I was doing a little grocery shopping and found myself in the cleaning aisle where I spotted the cans of Mr Sheen. Did you know there's a "Citrus Shine" variety now? I didn't. Aha! I thought. Lemony. I like lemon fragrance. I think I'll try it. I spent Saturday going from room to room, clearing surfaces and polishing like I was expecting visitors. But you know what? The Citrus Shine stuff smells a bit like insecticide. Not a lot, just faintly. Maybe there is an ingredient added to deter termites and other wood loving creepy crawlies? Wood lice? I bet you never thought geometry could be exciting! To join in with Sunday Selections, post photos of your choice under the SundaySelections title, then go to Kim's site, add your name to her linky list and leave her a comment. Then have a look at what others have posted for their selections. I've been in a really good mood for the last few days. Sometimes life just happens that way. As I sit here, typing, reading, watching TV, I look around and see that I am surrounded by smiles. On the walls of my lounge room there are many photos of my family. In my lounge room there's probably 300 smiles and there's a few in the bedroom too. And I have other things that are smiling too. Drusilla, the vampire witch is smiling. Jessy witch, who holds some of my earrings and necklaces, is smiling. The little witches (there's twenty of them) that live in the Witch House, are smiling. The little garden pixies are smiling. Ever noticed how dust and fluff come in selective colours? If you have a pale carpet and light coloured furnishings, the dust is brown or black. 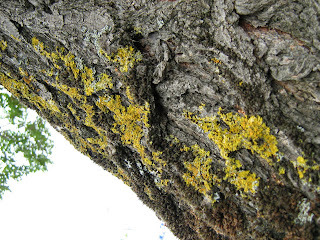 If you have a dark carpet the dust and fluff that collects or falls is white. Pilling on white clothing is always dark, so it's highly visible. Pilling on dark clothing is always white, so it's highly visible. Both mean careful shaving with a twin blade razor or lint remover. Dust bunnies under beds and in corners are always grey. 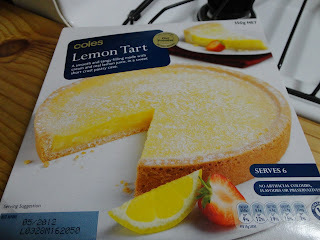 A few weeks ago I spotted this Lemon Tart in the freezer section of Coles. Only $5 too. I like lemony things, so I bought one to try. and I liked the description of the filling. The tart is wrapped in plastic, (but that picture wouldn't load), and sits on a small circle of cardboard. it's not bad....the pastry is a bit thicker and firmer than I would make, more like a frozen shortcrust than a fresh homemade, but nice enough. The filling is nice. Lemony and creamy, with a sprinkling of icing sugar. Mmm. I'd buy this again and I wouldn't hesitate to serve it to visitors. I'm prompted to sign in, but when I do, I just continually get bounced back to the sign in page. So I ignore signing in and go straight to reading comments on my latest post. Then of course, I want to reply to these. My comment reply comes up as anonymous, with a word verification, which I enter, then up pops the same window with the same comment replies and a different word to verify. So back I go to the sign in page and click on "help"
Eventually work my way through several clues to reset my password, then through another stage to reset my email address, which has changed but not been recognised by Blogger, probably because I didn't do the correct steps for that......but I thought that changing it in my profile settings was all that was necessary. But how often do you see the other side, the underbelly? 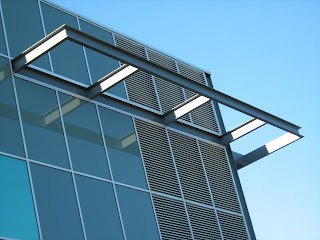 The structural parts that make up the whole? I think this is the cage for maintenance workers to access the framework. 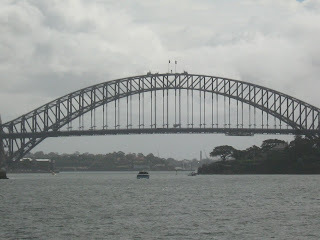 The straight bit leading onto, or off, the bit under the arch of our famous "coathanger". Try again. And keep on trying. Eventually something will grow. Here in this tub are 2 cauliflower seedlings on the left; 2 broccoli seedlings on the right. One of my favourite winter side dishes is cauli and broccoli baked in cheese sauce. Preferably served alongside roast beef. Another cauliflower. I have 4 altogether. Here is another broccoli. The feathery green in the background is carrots. In this tub are 4 cabbage seedlings. I really love my green vegetables. See that tiny seedling on the left in the middle? Here it is again. It's a mini cabbage. Full sized the head is firmly packed and about 4 inches across. Much more economical for a single (or two) person household. I have mini cauliflowers too, they're about the same size as this tiny cabbage. Once this lot is harvested and shared around with my family, the tubs will be dug over, have compost and a little manure added, then they'll sit idle for a couple of months before planting again with summer produce. For Sarah because she asked. Line a brownie pan (swiss roll tin/slice tin) with greased foil. Put butter, sugar, milk, marshmallows in a heavy based saucepan. Stir over low heat until marshmallows are melted. Mixture will now begin to boil. Continue stirring and boil for eight minutes. Remove from heat, stir in broken up chocolate and vanilla essence. Allow to cool and set. In fridge. Turn out, remove foil, cut with knife dipped in hot water. They're almost like barnacles aren't they? To join in with Sunday Selections, post photos of your choice under the Sunday Selections title, then go to Kim's site, add your name to her linky list and leave her a comment. 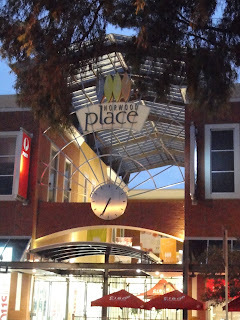 Today's photos are of the Norwood Mall, across the road from Norwood Place which featured yesterday. But first:- the entrance to Norwood Place, the photo I couldn't find yesterday. This photo, and the next one showing the Norwood Mall entrance were taken in the early hours one day, around 6-6.30am. Looking through the Mall, towards the Parade. On the left, Beads on Parade, Vego to Go. Notice the big blue gate? There are 5 sets of these to completely close off the mall at night. Locked and padlocked. Chocolates on Parade has excellent fudge, but not as good as the one I make myself. Dillons Newsagency is still there, although much expanded now and with new owners. Who doesn't remember Duffy's Bakery? With the best pasties in Norwood. The kitchener buns are yummy too. Escape Travel, where the grungy old toilet block used to be. Norwood Fine Foods, where I (very) occasionally buy miniature apple pies. "sad face of the girls no one wants"